Precision determines the variation of a method over a number days, and optionally over one or two runs per day. A method measured on a continuous scale over a number of days, with one or two runs per day. At least two replicates must be observed for each run, and all cases must have the same number of replicates. Data in existing Excel worksheets can be used and should be arranged in the List dataset layout. The dataset must contain at least two continuous scale variables containing the observations (in replicate) for a run of the method. If two runs are observed then a List dataset with repeat-measures and replicates layout should be used to arrange the two runs and replicates for each run. When entering new data we recommend using New Dataset to create a new precision dataset. Select any cell in the range containing the dataset to analyse, then click Precision on the Analyse-it tab, then click 1 and 2 Run over Days. Select any cell in the range containing the dataset to analyse, then click Analyse on the Analyse-it toolbar, click Precision then click 1 and 2 Run over Days. Click Run 1 and Run 2 and select the runs and replicates to compare. Leave Run 2 empty to perform a 1 run analysis. Enter Pre-assigned concentration of the analyte, if known. If left blank Analyse-it will use the mean of all observations as an estimation of the true concentration. The report shows the total number of observations analysed, number of days analysed including the number of days excluded due to outliers or missing values, runs per day, and replicates per run are shown. The Concentration (if the pre-assigned concentration was specified) and the Mean concentration of all replicates are shown. If the pre-assigned concentration is not known, the mean is used as an estimate of the true concentration. Total (within device/laboratory), repeatability (within run), between run (if 2 runs are analysed) and between day precision are shown. The SD, a confidence interval for the SD, and the CV are shown. A precision plot (see below) shows the standardized observations for each day. If a day is excluded due to missing values the observations for that day are not plotted, but if a day is excluded due to outliers (determined using the preliminary SD, see below) the day's observations are shown as red crosses. 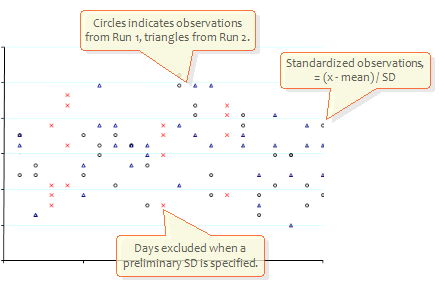 Precision analysis can identify and exclude outlier observations if a preliminary SD for the method is known. The preliminary SD for the method may be known in advance or can be determined using a preliminary experiment. The recommended preliminary experiment requires 20-replicates to observed in a single run, then the SD determined (see Simple precision analysis). When the preliminary SD is specified Analyse-it excludes a day's observations when the difference between the minimum and maximum observation within a run is greater than 5.5 * Preliminary SD. If the 1- & 2- run Precision dialog box is not visible click Edit on the Report toolbar on the Analyse-it tab/toolbar. Observations for any day excluded due to outlier observations are shown as red crosses on the precision plot (see above). The n and Days statistics are adjusted to show the number of days analysed and the number excluded from analysis. Total precision (within device or laboratory) can be compared against a performance goal. Allowable precision can be specified in absolute units of the analyte, as a percentage of analyte concentration, or as a combination of the two in which case the larger of the absolute and percentage concentration is used. Click Compare against and select Imprecision specification. Enter Allowable imprecision as an absolute value, as a percentage of analyte concentration, or enter both values for a combination. Goal total precision, calculated from the imprecision specification and the concentration level, and a hypothesis test to test if the observed precision is within the goal are shown. If the p-value is significant the observed precision is outside the goal. Total precision (within device or laboratory) can be compared against a random error% of a total allowable error goal. Total allowable error can be specified in absolute units of the analyte, as a percentage of analyte concentration, or as a combination of the two in which case the larger of the absolute and percentage level is used. Enter TEa (total allowable error) as an absolute value, as a percentage of analyte concentration, or enter both values for a combination. Enter % for Random error, the percentage of the TEa to allow precision to vary within. Total precision (within device or laboratory) and repeatability (within run) can be compared against a manufacturer's claim to demonstrate a method is operating correctly. Click Compare against and select Performance claim. Enter Total and Repeatability precisionas absolute values, as percentages of analyte concentration, or as a combination, from the manufacturer's claims. Goal total and repeatability precision, calculated from the claim using the concentration level, and hypothesis tests to test if the observed precision is within the claim are shown. If the p-value is significant the observed precision is statistically worse than the claim. Evaluation of Precision Performance of Quantitative Measurement Methods (2nd Edition).